Firstly, traditional forms of advertising such as TV and billboards were banned, followed by sports sponsorship, and, most recently, point of sale displays in shops. All that was left was tobacco packaging: a way to communicate to consumers the appeal of the product and to promote different brands. My team at the University of Stirling has conducted research on tobacco marketing for many years, funded by Cancer Research UK. 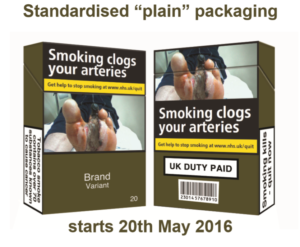 Most recently we undertook our own studies on tobacco packaging, and then in 2011 were commissioned by the Department of Health to review all the evidence on plain or “standard packs.” Our review provided the basis for a UK consultation on the issue. At the time we found 37 studies, conducted in different countries and using a variety of research designs. Their findings were consistent. The studies showed that standard packs are: less appealing, increase the visibility and effectiveness of health warnings, and reduce the ability of packaging to mislead people about the harms of smoking. The public consultation received more than 2000 responses and many of these were supportive of standardised packaging. However, neither the consultation nor the evidence were enough to convince the UK government to proceed with the measure at the time. Australia went ahead and introduced standard packs at the end of 2011, but calls were made to delay UK legislation until the results of Australia’s policy were known. The Scottish government included a commitment to introduce standard packs in their March 2013 tobacco control strategy even if the UK delayed. Yet the Westminster government remained unsure and later in 2013 commissioned a senior paediatrician, Sir Cyril Chantler, to examine all the evidence for himself and make recommendations. Yet the debate continued. The government launched a further public consultation, this time on draft regulations. Finally, in January 2015 they announced that they would proceed with legislation, and this was eventually passed in March 2015. At each step in the process, public health campaigners used the evidence from our review, new studies, and Australia’s experience to make the case for standard packs. ASH, Cancer Research UK, the British Heart Foundation, and others worked together through the Smokefree Action Coalition to raise public awareness and support and to persuade politicians. Yet at the same time tobacco companies used their considerable resources to run advertising and lobbying campaigns against the policy. They raised the prospect of increased illicit trade (not supported by evidence from Australia) and argued that standard packs infringed copyright and trademarks. They launched legal challenges through the European Court of Justice (ECJ) and the UK Courts in an attempt to undermine or delay the policy. But they lost. On 4 May 2016 the ECJ ruled that European legislation that permits the policy (the EU Tobacco Products Directive) was lawful. Then on 19 May 2016 the action brought by British American Tobacco UK Ltd and others v Secretary of State for Health for the annulment of the UK regulations was dismissed by the High Court. So soon we will follow Australia. Cigarettes and other tobacco products will be sold in uniform packs of 20 cigarettes, with large visible health warnings and only the name of the brand distinguishing one pack from another. A sell-through period of 12 months will allow existing stock to be sold and standard packs gradually introduced. From all the evidence I have seen, I would expect these new packs to clearly send the message that smoking is harmful and unappealing. I don’t expect this to suddenly result in adult smokers stopping in droves—there are other developments (such as stop smoking services and electronic cigarettes) that can help achieve that. Yet if this policy contributes to fewer children starting to smoke, as I expect it will, then the public health gains will be significant. We now need to turn our attention to evaluating the impact of this change. These evaluation results could inform efforts in other countries to remove branded tobacco packaging—the “silent salesman” of a uniquely deadly product. Linda Bauld is professor of health policy and director of the Institute of Social Marketing at the University of Stirling. 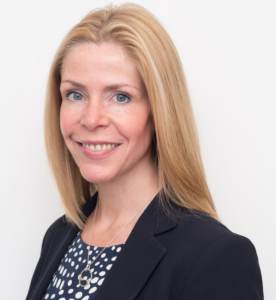 She is also deputy director of the UK Centre for Tobacco and Alcohol Studies and holds the CRUK/BUPA chair in behavioural research for cancer prevention at Cancer Research UK.